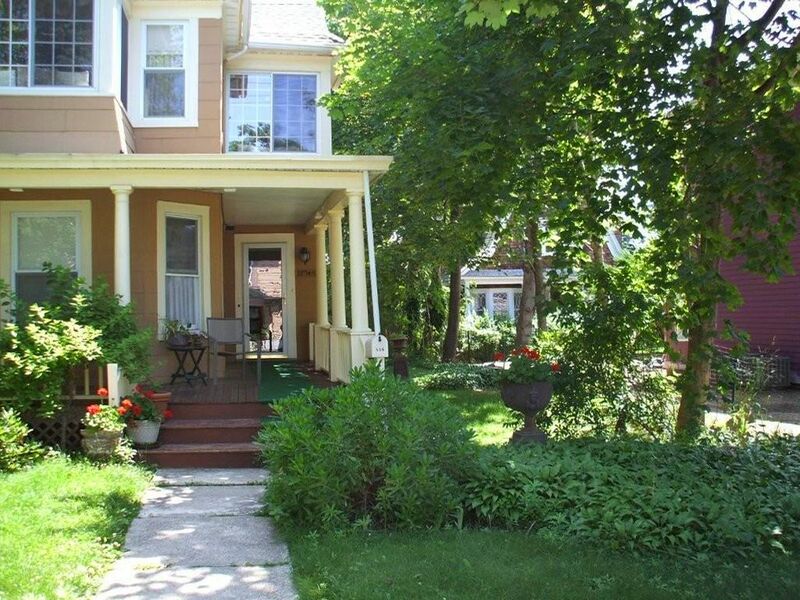 Historic 1905 Victorian home in the heart of Greenport Village. This charming apartment on the first floor of a two family home boasts high tin ceilings and is within walking distance to shops, restaurants, train & bus stations and many other amenities. Several beaches are a short walk or bike ride away. The apartment has a large eat in kitchen, sitting room, living room and two bedrooms plus a Murphy double bed in one of the living areas. There is central air, heat and Internet access. Full kitchen with dishwasher, washer/dryer, There is a covered front porch and a lovely enclosed garden for grilling and relaxing. It is near beaches, vineyards, farm stands and four star restaurants. The village of Greenport has become an art destination with many fine galleries. The area also has live theater, and music. There is on site parking for one car. My husband and I, along with my parents, stayed at Joyce and Hector’s wonderful apartment over Labor Day weekend. It had plenty of space for all four of us, two full bathrooms, a parking spot, and best of all, it was in walking distance to town where we had fun shopping and going out to dinner each night. Meeting up with Joyce to get the keys was super easy since she lives right upstairs, and she gave some great winery recommendations. The apartment was spotless, too. Highly recommend to anyone planning a trip to the North Fork! Hector and I are delighted that you enjoyed your stay here. Greenport is a walking town and we feel fortunate that we are so close to the hub yet far enough away for you to enjoy the serenity that it also has to offer. A pleasure meeting the four of you and come again! An artful, spacious, gracious stay, convenient to everything. The “apartment” is most of the first floor of the owners home, taking the space formerly used as a gallery. It is beautifully decorated and furnished, with two large sitting rooms, one with a Murphy bed, plus two bathrooms, two bedrooms and a spacious kitchen. The back deck and front porch are also large and pleasant. The owners are a delight and happy to give good local recommendations. Thank you Harshad and Nandini! We so enjoyed your stay here and both Hector and I look forward to seeing you again very soon. One of my most enjoyable vacations. I'd. give it a 4.5 star rating. This large apartment on the main floor of a two-story home is comfortable, nicely decorated and was very enjoyable for my wife and me as well as my daughter, her husband and their two very young children. The home had everything from a fully equipped kitchen to a quiet back yard with a grill. We were a short walk to the center of the village and a few minutes away from two lovely beaches by bike or car. This was a relaxing vacation. We loved it. The owner was warm, very helpful and readily available. She even left a bottle of wine in the fridge for us at arrival! I loved our stay here! Greenport is a gem and the home was wonderful, full of original art. The husband is an artist and has his studio on the property. What a special place! You would think that we would be happy to see these guests leave with the two babies etc. but we were not! The whole family was delightful and we so enjoyed having them here. We are so delighted that they enjoyed their stay and hopefully they will return. We arrived for the weekend to go to a wedding at Brecknock. The first pleasant surprise was the large kitchen with tons of space so I could ice the 280 cupcakes I had brought with me for the wedding. Also, the entire house was spotlessly clean. Joyce provided a lovely welcome, and we felt right at home. We had 4 people total and it was so much more pleasant than any hotel could be. We had the two bedrooms, living room, big kitchen, and didn't even use the sitting room with Murphy bed, which could have accommodated one or two more people. From the pictures, we knew it was beautiful, but the paintings and the furniture and rugs all combined to make this an artistic and comfortable get-away spot that was completely rejuvenating. Loved, loved, loved this place. A very quick walk to town and all the coffee, breakfast and restaurant spots you could wish for. Fun biking, and great beaches. Wish I could be there now! Thanks for a great visit, Joyce and Hector! The cupcakes were a dead giveaway! Thank you both for this great review and for those delicious cupcakes. They were the best we have ever tasted. Have you ever thought of living here and opening up a pastry shop??? Enjoyed having you and by all means, come again. Beautiful home, comfortable to spend time in, and close enough to everything in town to make the whole weekend very walkable. The hosts were quite helpful and accommodating. The house sleeps six if you pull down the Murphy bed in the sitting room (it was actually very comfortable). Big kitchen. Nice porch and yard. Highly recommend this place!